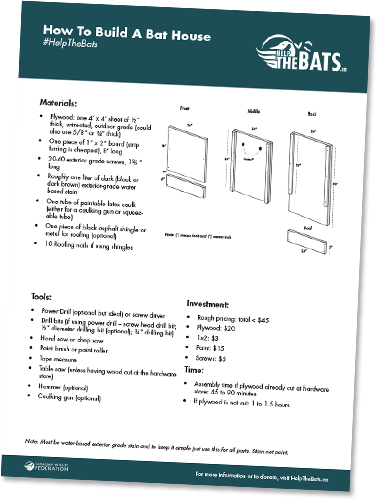 Here are several ways of building and installing your own bat house. We recommend downloading this "how to" PDF, though the options below are also approved. While most bats are starting their hibernation at this time of year, seeking a place to hunker down to stay warm and toasty for the winter months, you’ll still see their silhouettes everywhere. Bats are right up there with witches, skeletons and black cats when it comes to Halloween décor - meant to spook us all, young and old. In truth, they’re harmless and actually helpful small mammals. The spookiest thing about them? How fast they’re vanishing from Canada. Over the last 10 years, millions of bats have died in Canada. Without our help, they have little hope of bouncing back. That’s why it’s important to ditch the fear based mindset when it comes to our bats and start helping these adorable winged creatures survive. So what can you do while they’re hibernating? Start thinking ahead. 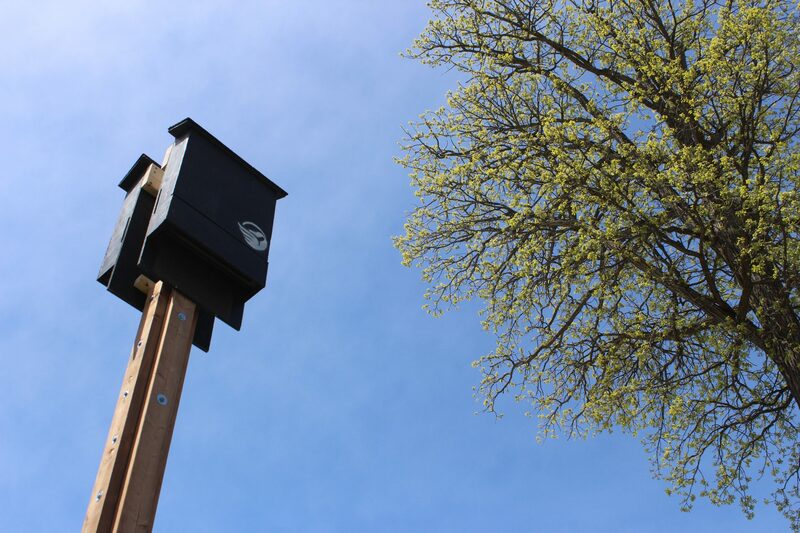 Keep reading to find out everything you need to know about bat boxes (from size to colour) and where to place them in your backyard so that when our bats emerge from a long winter’s slumber, they’ll know just where to go. When it comes to bat houses, bigger really is better. Female bats love to roost together and so you’ll want to buy (or build!) a bat house with multiple chambers to attract these mamas to be. You might attract a good sized colony of female bats; perfect to ward off all those pesky mosquitoes in your backyard. If you’ve already got a smaller bat box with just one chamber, don’t toss it! Put it up too. Males are more solitary and will happily enjoy a smaller bat box – the ideal bachelor pad! Whether you’ve built your own bat box or you bought one at a store, you’ll want to make sure your bats can stay nice and dry in there (you know how rainy our springs can be). Be sure to caulk the bat box. Next you can scuff up the inside of the box so that bats have something to hang on to. Now it’s time to decorate your bat box! Give the exterior a couple of coats of dark paint, but leave the interior alone. It’s best to use black paint – opt for a paint that is not oil based and also is non-toxic. A dark coloured paint, like black, will help to keep the bat box toasty warm. Once you’ve got your bat box ready to go, you’ll need to start thinking about location. As night creeps in, go ahead and turn on your outdoor lights. This will give you an indication of where not to place your bat box. Bats don’t mind hunting for yummy bugs near your outdoor lights but they most certainly will not roost near one. So plan to put up your bat box far away from exterior lights. During the day, check out the sunniest spots on your property. Bats need warmth when they’re roosting, and prefer bat boxes that have balmy temperatures of of over 40˚C. You’ll want to look for areas in your backyard that get direct sunlight for about eight to 10 hours a day during the summer. So take a look for a couple of locations that might do the trick for your batty friends. How high can you get your bat box? You’ll definitely want to place it three-six metres high. And while you might think a tree would be a handy spot to place a bat box, trees are actually bad spots for bat boxes. Bats really need easy access to their homes and branches are hard to navigate when they’re swooping in. Trees also provide easy access for predators, like cats. So you’ll want to place your bat box on either a pole or a building. Don’t forget! Three metres or higher, please!